This section has old photographs taken from Ruddington to Loughborough. Looking north from the road bridge at Ruddington station showing the end of the line and the trackbed leading on to Nottingham. April 1975. Looking south from the road bridge at Ruddington station with the bare platform in the foreground. In the distance “50-steps bridge” can just be made out. April 1975. The site of Ruddington station taken from the arriving ‘Ruddington Requiem’ special train, as it slowly approached the limit of the line at a buffer stop just north of the station, June 1984. In the distance the ‘Ruddington Requiem’ special train has reached the end of the line just to the north of the station. 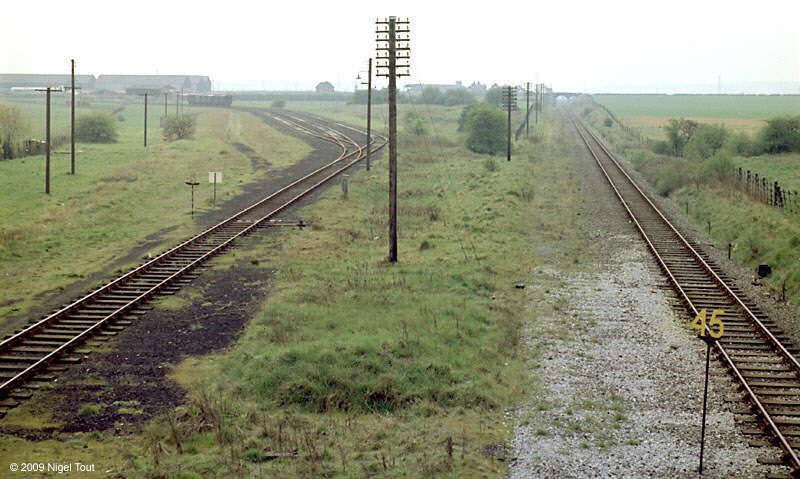 The remains of the north bound platform is on the right, June 1984. 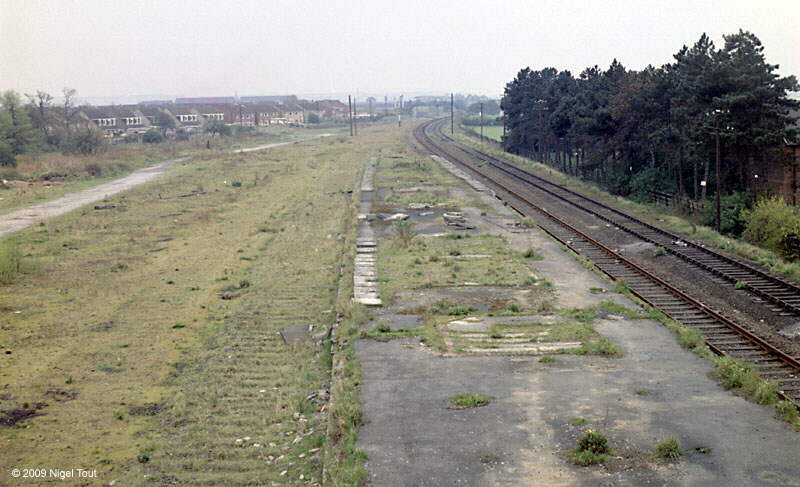 Looking north towards the site of Ruddington station site from ‘50-steps bridge’. April 1975. 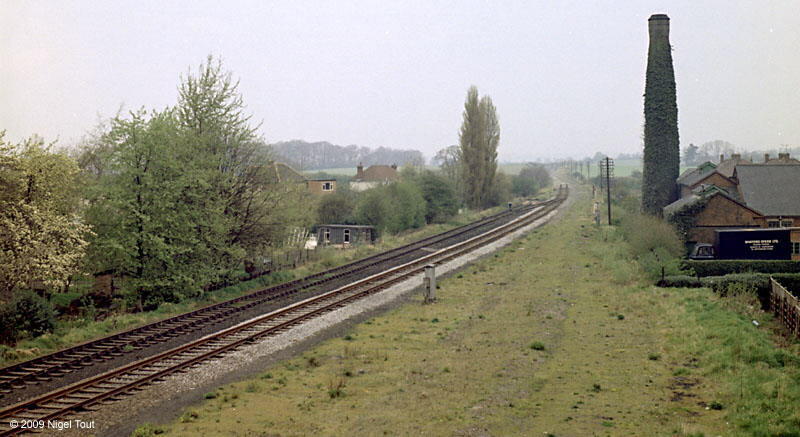 Looking south from ‘50-steps bridge’ towards East Leake and Loughborough. 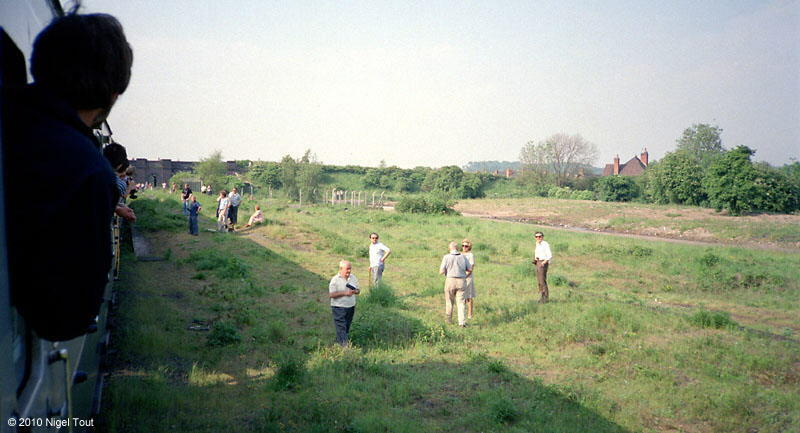 On the left is the line leading to Ruddington Ordnance, Storage and Disposal Depot which was then in use, as can be seen by the line of vans in the distance. With the closure of the route from Nottingham trains to the depot would come from the south, via a new chord from the Midland Main Line. April 1975. A few miles south of Ruddington is the Gypsum works at Hotchley Hill, alongside Rushcliffe Halt. Here in June 1973 one of the works RH diesel mechanical shunters is propelling some empty wagons into the works from the exchange sidings with the ex-GCR line. East Leake goods yard, looking south east, photographed from the returning ‘Ruddington Requiem’ train, June 1984. Houses now occupy this area. 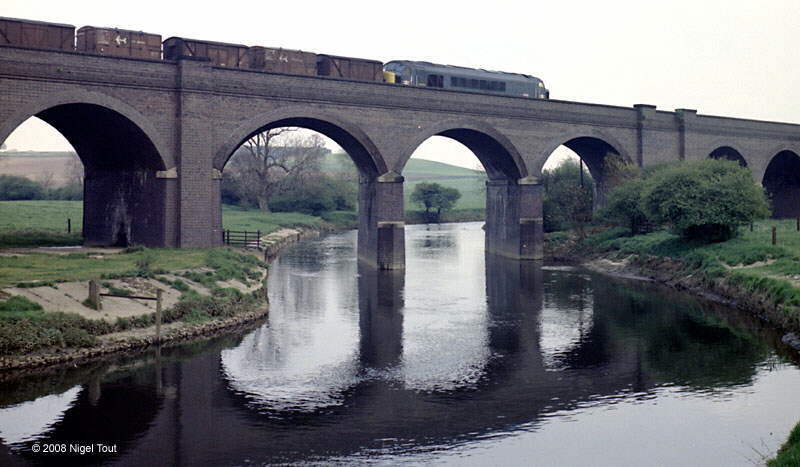 In May 1975, “Peak” 1-Co-Co-1 45003 heads south on the viaduct over the River Soar at Loughborough Meadows. The vans and old-style containers will have come from Ruddington Ordnance, Storage and Disposal Depot. The train will take the chord from the ex-GCR to the ex-Midland Railway at the new Loughborough Chord Junction. 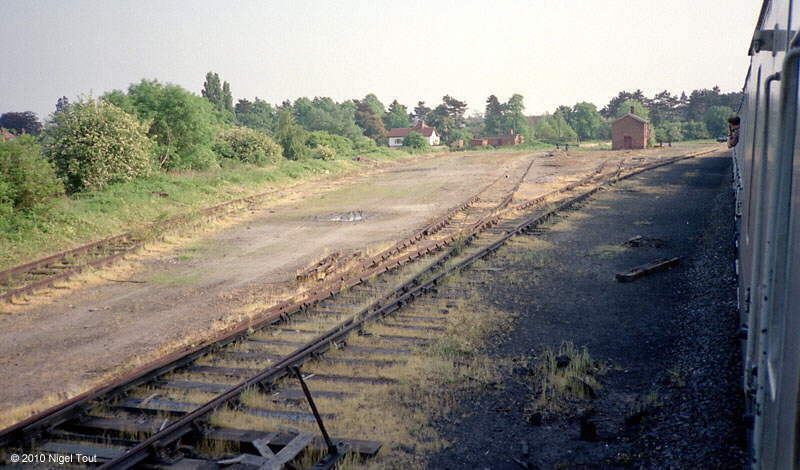 To give access to Ruddington ordnance depot and the gypsum works at Hotchley Hill, and allow the line of the Great Central railway in the centre of Nottingham to be closed and demolished, a chord was built on the northern outskirts of Loughborough from the Great Central line down to the Midland line. Below are some photographs of this chord being built. The chord from the Midland main line leading up to the Great Central line under construction in November 1973. Looking from Nottingham Road, the new chord is the more distant embankment on the left. Much of the material for it was obtained from the disused Great Central embankment off to the right, over the bridge over the Midland main line. 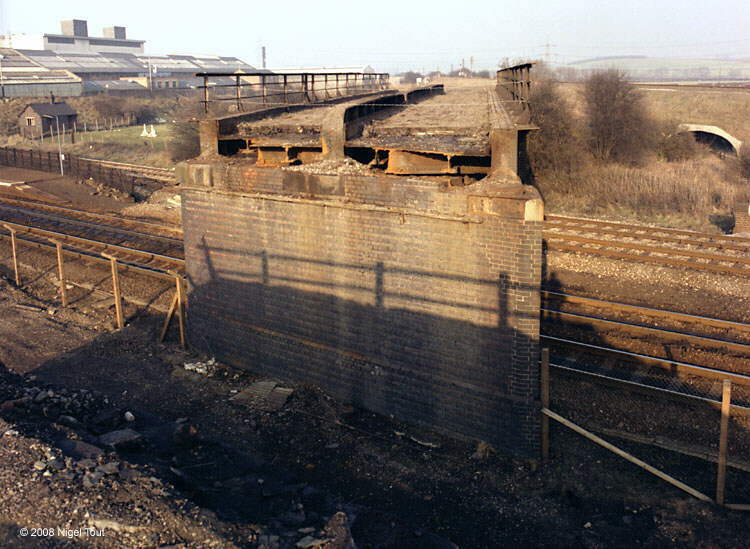 At this time the original Great Central bridge over the Midland main line had corrugated iron sheets attached to its sides to catch any material dropping from the lorries which transported the embankment fill from one side to the other during construction of the new chord. Here 1-Co-Co-1 “Peak” class, number D82, enters Loughborough Midland station under the bridge with an express from London. In this view the embankment for the chord was almost complete except for the conduit taking the Hermitage Brook. Looking south with the Great Central line on the right. 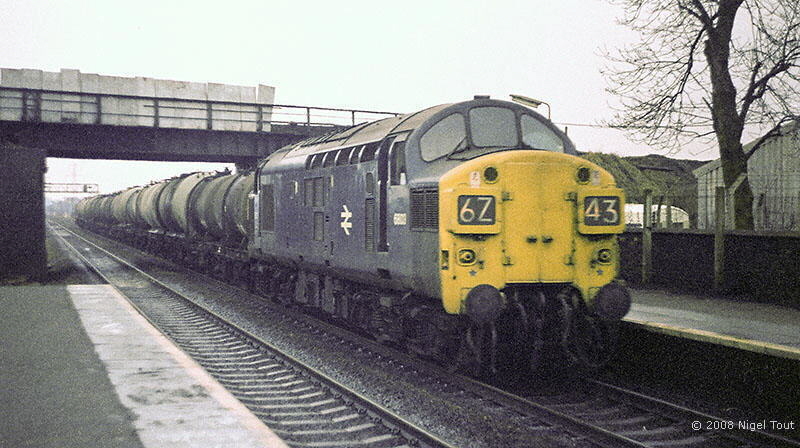 English Electric Co-Co number 6803 pulls a train of oil tanks northwards under the Great Central bridge at Loughborough. The corrugated iron sheeting to prevent material falling off the bridge can clearly be seen, January 1974. 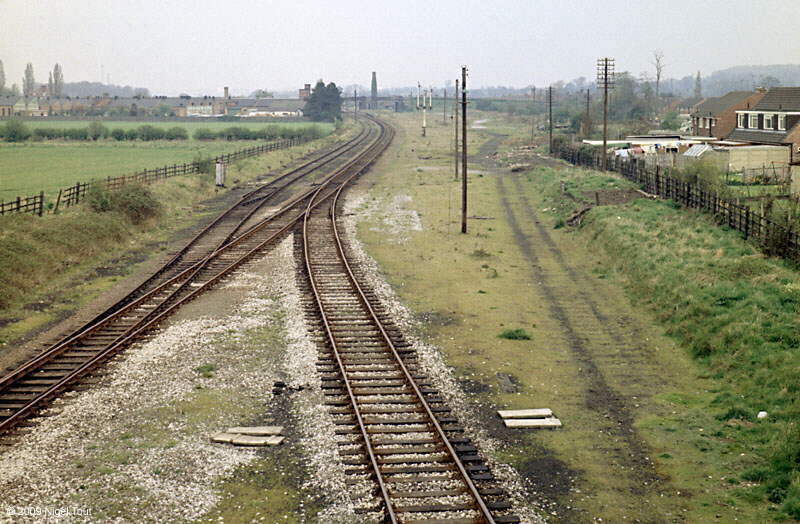 Photograph of the new chord ready for the track to be laid, taken from a northbound train on the Midland main line in January 1974. 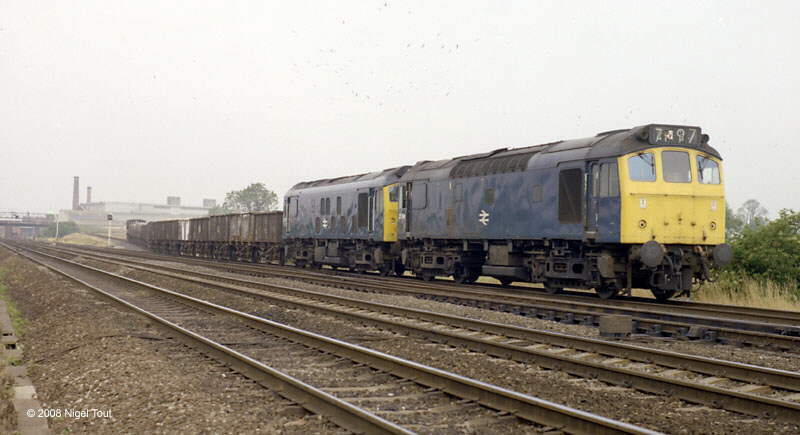 In July 1975, Bo-Bos 25104 and 25037 trundle down the completed chord from the ex-GCR onto the ex-Midland Railway main line at Loughborough Chord Junction with a train. The redundant GCR bridge over the Midland main line can just be seen in the distance on the left. 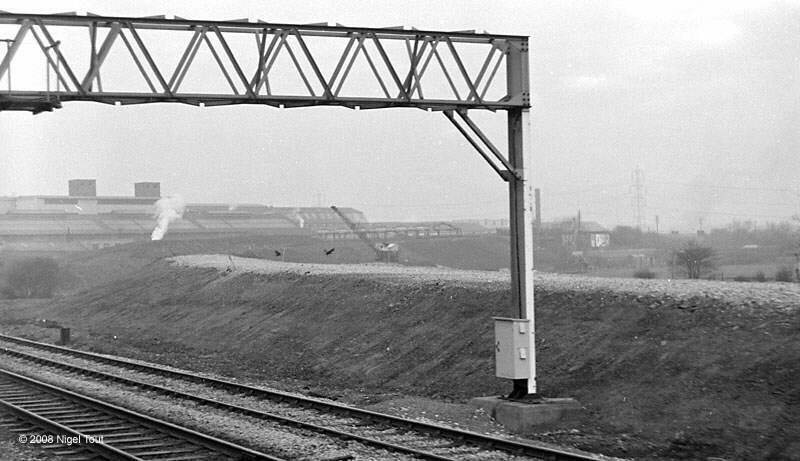 In winter 1979/80, the GCR bridge over the ex-Midland Railway main line stands ready for final demolition, here looking north. Part of the bridge has already been demolished since there were originally spans over four openings and the span over the southernmost opening in the foreground, which apparently never had any tracks through it, has already been demolished. The brick pier immediately in front is a central support not an abutment and above it is the cut-off end of the decking. Beyond on the right the new embankment with the chord from the GCR to the Midland can be made out, passing over a large concrete culvert. It was unusual for an embankment to be removed before a bridge, it was usually the other way round. 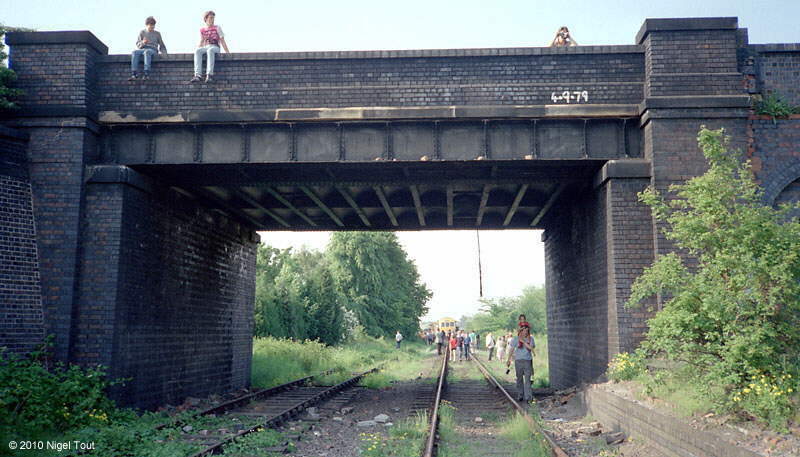 But this was the situation at Railway Terrace, just south of the bridge over the Midland Main Line, in 1981, and allows examination of the construction of the bridge abutment. Close up of the bridge abutment at Railway Terrace. 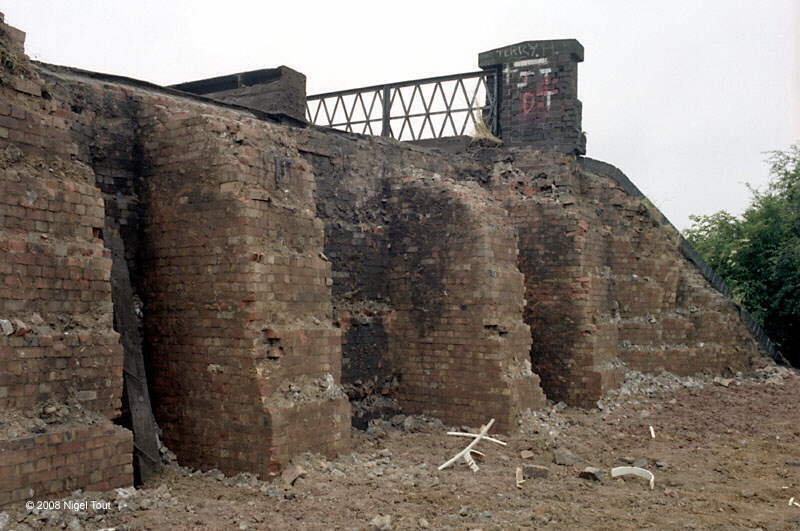 The buttresses would have strengthened the abutment, supporting it from any tendency to topple over, and would also have locked the abutment to the embankment. Looking south from on top of the Railway Terrace bridge along the line of the removed embankment leading to the northern limit of the preserved Great Central Railway. 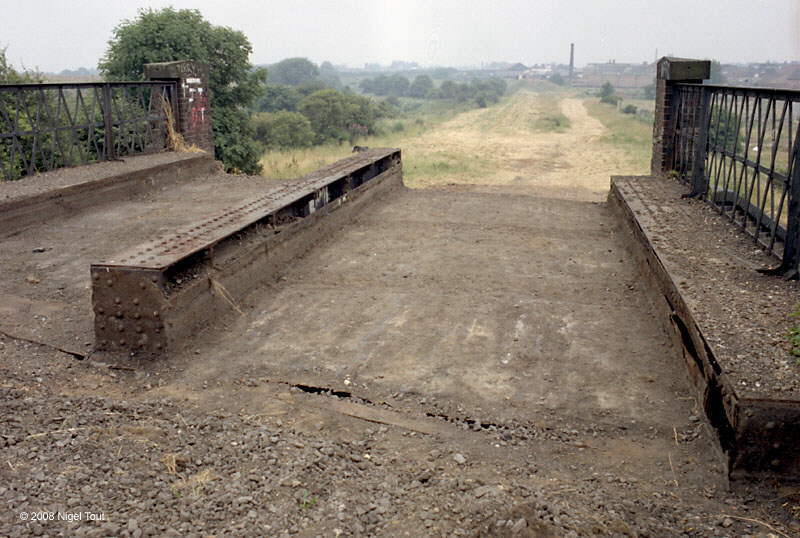 This bridge, which was subsequently removed, and the missing embankment are being be replaced as part of the GCR ‘Bridging the Gap’ project.